Proudly display your Irish family heritage with our Irish Claddagh badge! We have assembled 225 Irish surnames with the historically accurate family motto scrolled across the badge. 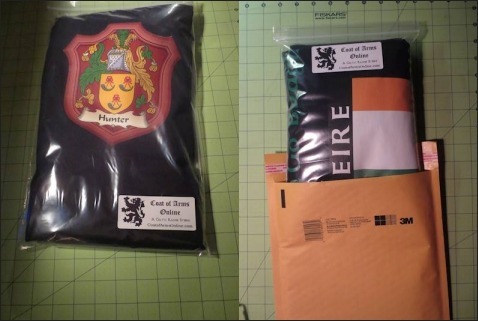 The design itself combines Saint Patrick, the Patron Saint of Ireland, and the famous Royal Irish Claddagh - symbolizing the trinity of Love, Loyalty, and Friendship" ( In Gaelic, "GrÃ¡, DÃ­lseacht agus Cairdeas" (pronounced 'graw, dealshocked ogis cordiss'). .
St. Patrick is the patron saint of Ireland and the Irish. He was born about 385 A.D. in Northern Wales. He studied religion in Europe to become a priest and bishop. He then brought Christianity to the Irish by teaching in Ireland for 29 years. 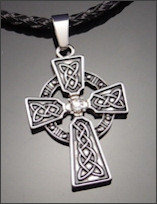 According to early Irish tradition, he died on March 17, 461 AD. 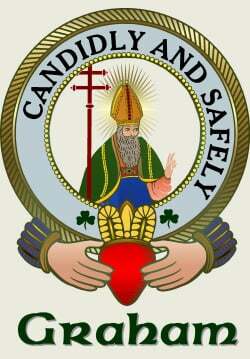 The anniversary of his death is celebrated as Saint Patrick's Day. 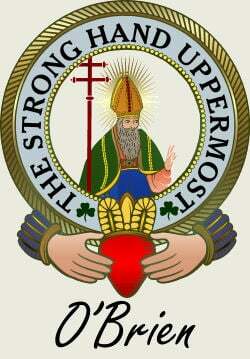 An Irish tale tells of how Saint Patrick used the three-leafed shamrock to explain the Trinity. He used it in his sermons to represent how the Father, the Son, and the Holy Spirit could all exist as separate elements of the same entity. 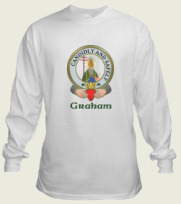 His followers adopted the custom of wearing a shamrock on his feast day. Green is associated with Saint Patrick's Day because it is the color of spring, Ireland, and the shamrock. Today St. Patrick's Day is celebrated on March 17 by the Irish as well as many countries and cultures with parades, parties, wearing of green, Irish songs and jigs. The Claddagh symbolizes the trinity of "Love, Loyalty, and Friendship" or, in Gaelic, "GrÃ¡, DÃ­lseacht agus Cairdeas" (pronounced 'graw, dealshocked ogis cordiss'). For our Long Sleeve Shirts, we only use Anvil 100% Cotton Deluxe Super Heavyweight Long Sleeve Henley for maximum durability and comfort. 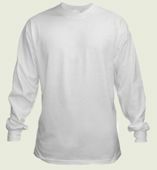 These soft and stylish Long Sleeve Shirts weigh an incredible 6.1 oz and are made of 100% deluxe cotton. They are pre-shrunk so that your shirt will not shrink during washing. 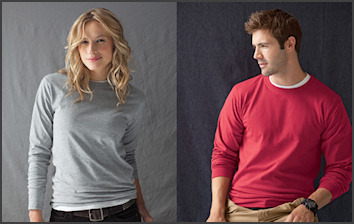 Features ribbed sleeve cuffs, double needle neck and bottom hem. We custom design and produce all of our clothing products with an industrial press and 400° hot peel technology! This results in superior manufacturing that will outlast even store bought products. Our Long Sleeve Shirts are available in sizes ranging from small to 3XL. Portrait designs measure between 6 to 8 inches across the product. Landscape designs (i.e. flags) measure 9 to 11 inches across the product. Our alternative smaller designs are centered under the left collar and measure between 4 to 5 inches across. We may proportional reduce the design on small and medium sizes.